Thank you for the knowledge you have shared with us. You make it interesting and easy to follow. I certainly enjoyed your talk and with this I would like to continue the next module not as a practitioner but for my family and friends and personal development. WHEN someone pointed out a lanky young man to me recently as a feng shui master, my immediate reaction was, understandably, one of disbelief. In all honesty, I had expected someone in his 70s or, optimistically, 60s, with a white beard on his wobbly chin. Yes, I was looking for a Gandalf-the-White look-a-like, albeit the Oriental version. "Just call me Joey," Joey Yap, 28, said firmly while I dithered over the "master" title or dai-si (a term used to address a feng shui guru). Well, Joey, as he calls himself, is not your typical feng shui master. He is actually a commerce graduate from Curtin University in Australia, but since graduation, has abandoned accounting for "wind and water". "It’s my childhood interest. I’ve been interested in Chinese metaphysics since I was 10, when I met my first feng shui master who came to do an audit on my home. "From then on, I just went around learning Chinese astrology and other forms of Chinese metaphysics, like mian xiang (physiognomy) and ba zi (destiny) on my own," he said. Joey’s enthusiasm even helped him overcome the language barrier because, like many today who studied in national schools, he was not well-versed with Chinese characters. "It was hard because there were no comprehensive English books on feng shui but I was just too curious about feng shui to let it slip from me just because I couldn’t read Chinese characters, so I taught myself to master the language," he said. After studying part-time under various gurus here during his school days, Joey was whisked off to Australia after secondary school for what his accountant father called "a proper education for a proper job". Undeterred, Joey continued to pursue his little "hobby" there by doing feng shui readings on the side, which earned him close to A$4,000 a month (RM11,200). After graduating, to his parents’ dismay, Joey was still adamant about pursuing feng shui. "They were not too happy that I took it up seriously. Understandably, because of the generally poor image of the trade as feng shui had been practised by some bogus masters," said Joey matter-of-factly. Nevertheless, despite their objections, he went to Hong Kong to "formally" study classical feng shui under various renowned masters there — an education funded entirely by his part-timer’s income. His teachers include masters like Lam Kwok Hung and grandmaster Chan Pui Sang, all of whom Joey still maintains regular contact with. But Joey has also encountered his fair share of bogus masters. So how would one know if a master is a fraud? Beware of impossible claims, he advised. "Feng shui can help improve our lives and maximise our potential for achieving better health, wealth or relationships, but cannot create millionaires or help you win the lottery. Much still depends on our destiny and own efforts," Joey explained. To prescribe feng shui fixes or cures, he said, one must also first know what is troubling the client. "We can find out through astrology or the study of ba zi — or what I call the Four Pillars of Destiny — from a person’s date and time of birth. "If a master does not know ba zi, then he’s unlikely to be effective because ba zi lets us diagnose, while feng shui is simply a prescription for an ‘ailment’," said Joey. It is also important to know that feng shui is not just about buying stuff and sticking them in all corners of our home. "That’s what I call New Age feng shui, which only cropped up in the early ‘90s. Real feng shui or classical feng shui is about understanding how to tap into and achieve equilibrium with the qi in one’s surroundings, to help maximise one’s potential or evade potential problems." Despite his age, or because of it, Joey’s been making waves in the feng shui world ever since he started wielding the luo pan (feng shui compass) full-time at the age of 20. Initially, many were sceptical because of his age. Established masters also put him down, claiming he was still "wet behind the ears". "Maybe there’s some unwritten rule that says feng shui masters must be middle-aged," he said. "But I’ve enjoyed proving them wrong — that one needed only to know one’s subject well and be passionate about it to be good." Today, not only is he a successful feng shui consultant, but he has also built a reputation for himself as a master trainer in the international arena. He founded the KL-based Mastery Academy of Chinese Metaphysics, the first formal institute in the world that teaches feng shui and Chinese astrology in structured English syllabus. The academy has over 8,000 students worldwide, with offices and training centres in over 30 countries, including the United States, Britain, Germany, France and Russia. Some of his students, many of whom are professionals like architects, engineers and even financial consultants, charge an average of US$2,500 (RM9,500) per consultancy. 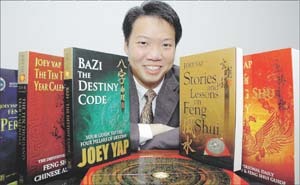 Joey has also created distant-learning programmes on the subject and written several books on Chinese metaphysics. Two of them, Stories and Lessons in Feng Shui and Bazi, the Destiny Code, are best-sellers. So despite not following in his father's footsteps, Joey has still managed to make him proud. "I’m happy to be doing what I am passionate about... being successful at it is just the cherry on top," he said.